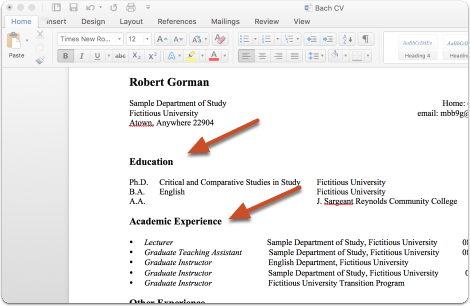 Make sure you give the files in your packet a meaningful title because reviewers will see the titles you provide as bookmarks to the left of the page when reviewing your documents. By default, the name that will appear to reviewers is the name of the file as you upload it, but you can also edit the title of a file after adding it to your packet. 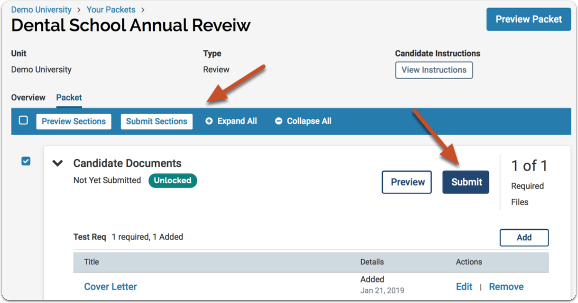 In addition to bookmarking the titles of the materials in your packet, our program will automatically bookmark the bolded headings, sections, and subsections within the documents you upload. 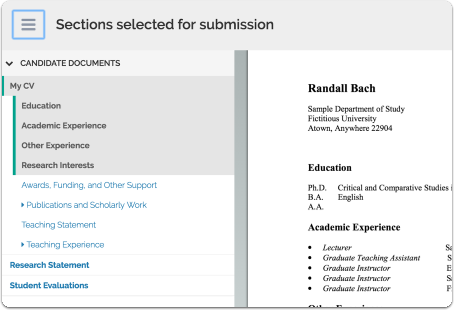 Reviewers will see these bookmarks nested beneath the document title, allowing you to draw attention to points in longer documents. See the article below for a more detailed explanation. Remember, the title of the file as it appears in your packet will appear in bold. Any bookmarks in the file are automatically shown in bold and will appear as subsections in the TOC of the packet. 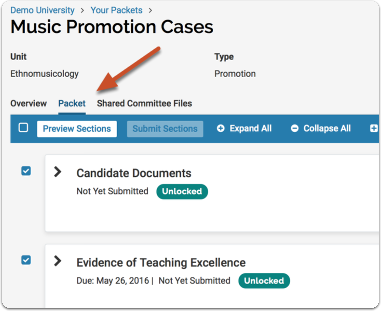 The preview shows exactly how the packet you are submitting will appear to your committee. A sample preview is shown below. 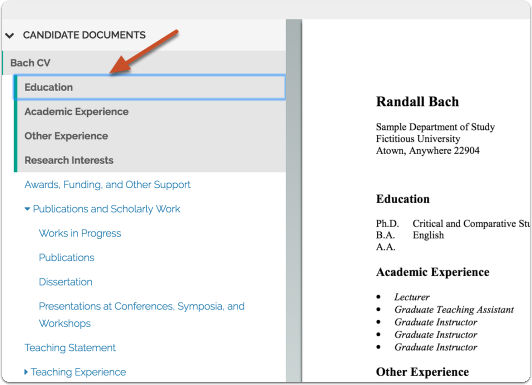 When you have satisfied all the requirements in your packet, or all the requirements in a section of the packet, it is a good idea to preview your packet to make sure all of your titles and bookmarks are displaying correctly. 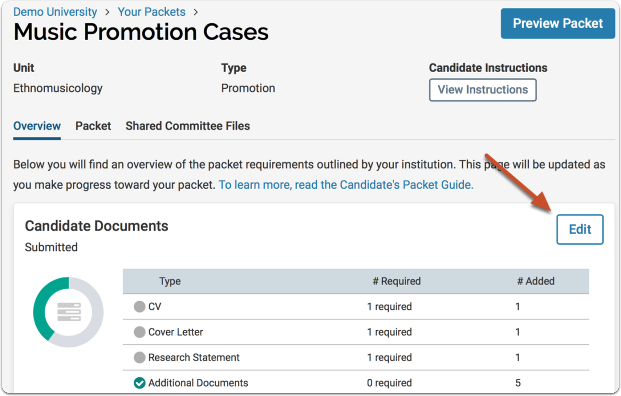 After you submit a section, the section appears as collapsed by default on the packet requirements tab of the packet. 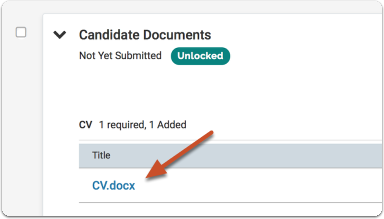 If the section is editable, and you add a document to a requirement within that section, the section then auto collapses again after the document is successfully added. 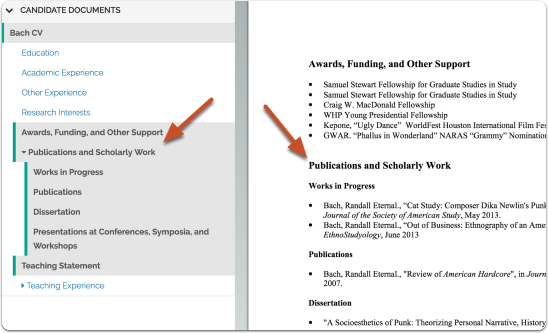 You can preview the completed section to see how it appears in the document reader to reviewers.